​Perseus was the son of Zeus and the mortal Danaë. An oracle told Danaë's father, King Acrisius of Argos, that his grandson, Perseus, would kill him, and so he sent Danaë and Perseus adrift in the sea in a small wooden chest. King Polydectes, the ruler of the island of Seriphos, rescued them. They began living on the island and soon King Polydectes became very fond of Danaë and wanted to marry her, but Perseus was very protective of his mother and he wouldn't allow King Polydectes near Danaë. King Polydectes hatched a plot to get rid of Perseus so that he could marry Danaë. King Polydectes sent Perseus to kill the Gorgons, thinking he could not defeat the hideous sisters and would instead be killed himself. 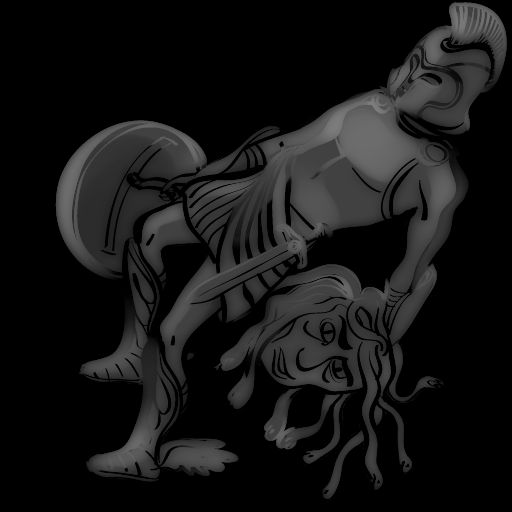 Armed with the wings of Hermes and the shield of Athena, Perseus beheaded Medusa after she turned to stone upon seeing her own reflection in the shield. Her blood spilled into the foam of the sea and Pegasus was born. Perseus climbed onto the winged-horse and fled the remaining Gorgon sisters. While on his way home, he spotted Princess Andromeda, who was chained to a rock next to the seashore. He used the head of Medusa to defeat Cetus the Sea Monster, who had been sent to devour Andromeda. Soon afterwards, Perseus and Andromeda were married. Every year, on August 12th, there is a meteor shower called the Perseids. This meteor shower has been given that name because all the meteors radiate outwards from a point in the sky located within the constellation of Perseus. 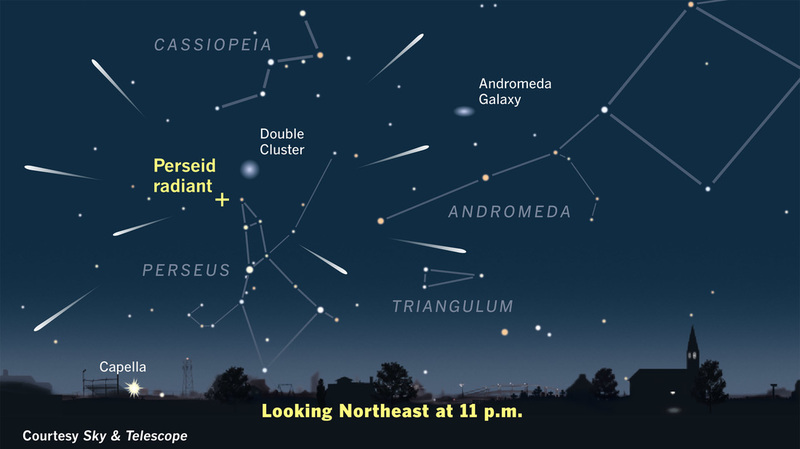 Also, each year on August 12th, Mr. D. and his friends and colleagues, host a public event at a dark sky location to observe the meteor shower. The observing site is located about 100 km southeast of Calgary. For more details, click here or contact the Big Sky Astronomical Society. 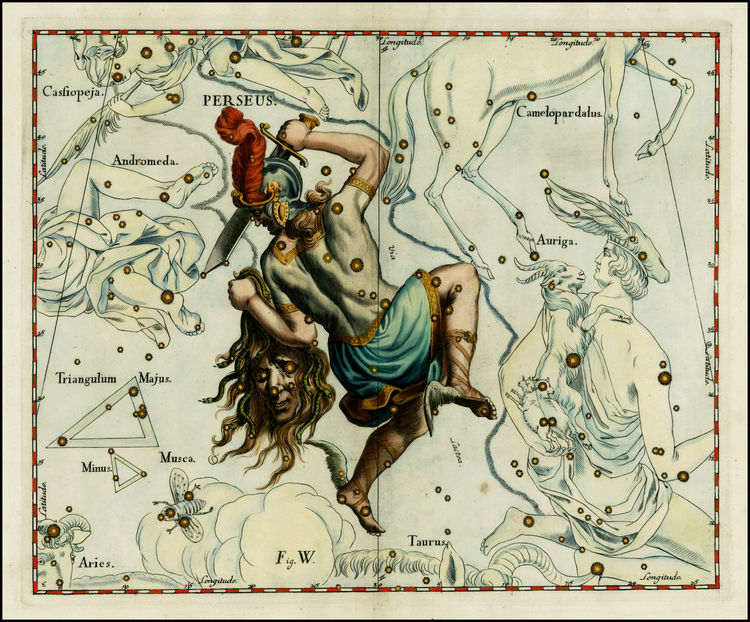 Star Maps from long ago were very artistic, as you can see below. 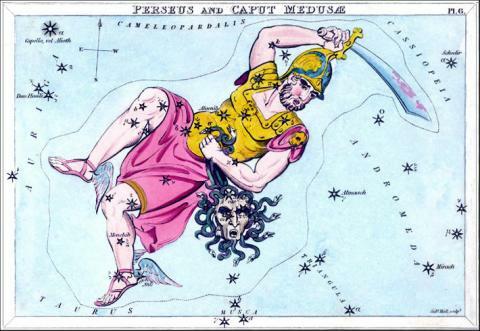 Notice how both star maps show Perseus with a sword in one hand and the head of Medusa in the other, as well as the wings of Hermes attached to his feet. 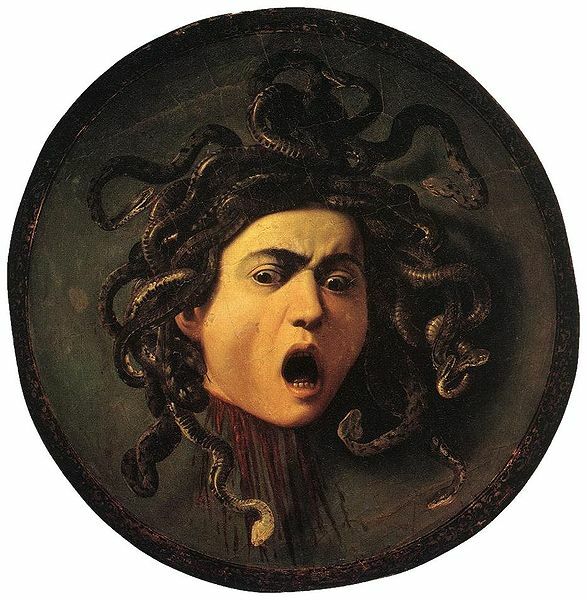 The Gorgon Medusa didn't have hair, she had snakes! Yikes! !